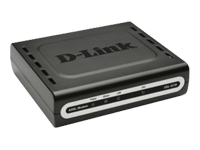 The DSL-321B ADSL2+ Ethernet Modem is a high-speed broadband modem for home and office use. Supporting the ADSL2+ standard, it provides speeds of up to 24 Mbps downstream and 2 Mbps upstream. The modem includes one ADSL port for connection to the phone line, and one Ethernet port for connection to your computer. Unlike USB models, it does not require any drivers. Along with instant connectivity, you can surf the Internet at very high speeds. The modem even identifies delay-sensitive data, such as videos or graphic-intensive Internet games and gives them higher priority which keeps the experience smooth and responsive.